By Aretha Franklin. Arranged by Tito Abeleda. Score, Set of Parts. 30 pages. Published by Visionary Quest Records (H0.531235-689329). Soprano Sax (solo) Alto Sax (2) Tenor Sax (2) and Baritone Sax (2) Perfect song to jam to with your fellow saxophone players in the band. Words and Music by Otis Reading. Arrangement by Tito Abeleda (Https://www.visionaryquestrecords.com) Artist: Aretha Franklin. Duration: 2:51 As a classic favorite made famous by Aretha Franklin, you will it a favorite for all types of settings. 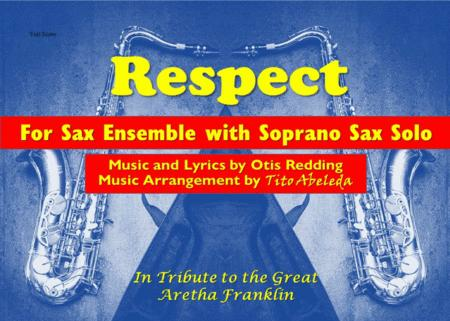 This musical arrangement was done in tribute to Aretha's recent honor at the Grammy Awards. I have arranged this piece for other types of ensembles.